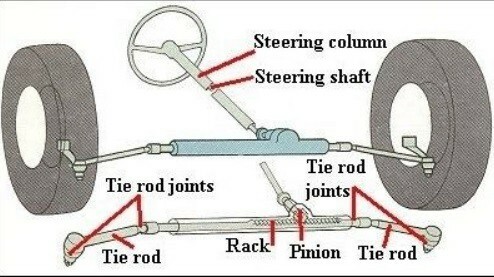 Steering is the collection of components, linkages, etc. which allows any vehicle (car, motorcycle, bicycle) to follow the desired course. An exception is the case of rail transport by which rail tracks combined together with railroad switches (and also known as ‘points’ in British English) provide the steering function. The primary purpose of the steering system is to allow the driver to guide the vehicle. Worm and Wheel Steering Gear. Worm and Roller Steering Gear. Re-circulating Ball type Steering Gear. Cam and Peg Steering Gear. Cam and Double lever Steering Gear. Worm and Sector Type Steering Gear. 1. It converts the Rotary movement of the steering wheel in to the angular turning of the front wheels. 2. It also multiplies drivers efforts and give MEHANICAL ADVANTAGE. This type of steering gear has a square cut screw threads at the end of the steering column; which forms a worm, at the end of it a worm wheel is fitted and works rigidly with it. Generally covered shaft is used for the worm wheel. The worm wheel can be turned to a new position the drop arm can be readjusted to the correct working position. In this type of gear box the endless chain of balls are provided between the worm and nut members. The nut form a ring of rack having an axial movement. So that the sector on the rocker shaft racks, the balls roll continuously between the worm and nut. Being provided with return chambers at the ends of the worm. This method reduces friction between worm and nut members. This type of steering gear is used for heavy vehicles. This is common manual type of steering gear box is used in most of the vehicles. In this type of steering a pinion is provided the bottom end of the steering column. The teeth of the pinion wheel in mesh with corresponding teeth provided on the rack, the end of which are connected to the stub axle through the rod. The rotating motion of the pinion operates the rack in FORE and AFT direction which in turn operates the stub axle. The cam and lever steering uses one or two lever studs fitted in taper roller bearing. When the worm in the form of helical groove rotates the stub axle and it also rotates along with it. This imports a turning motion to the drop arm shaft. In this type the worm on the end of the steering shaft meshes with a sector mounted on a sector shaft. When the worm is rotated by rotation of the steering wheel, the sector also turn rotating the sector shaft. Its motion is transmitted to the wheel through the linkage. The sector shaft is attached to the drop arm or pitmen arm.